Two recent publication about DNA sequences from the European Bison (Bison bonasus) illustrate different strategies and their results in the molecular analysis of natural history. Gautier and colleagues sequenced complete genomes from two male Wisents from the Bialowieza forest. By comparing Wisent and Cattle genomes Gautier and colleagues could determine separation and subsequent genetic exchange of the two lineages. 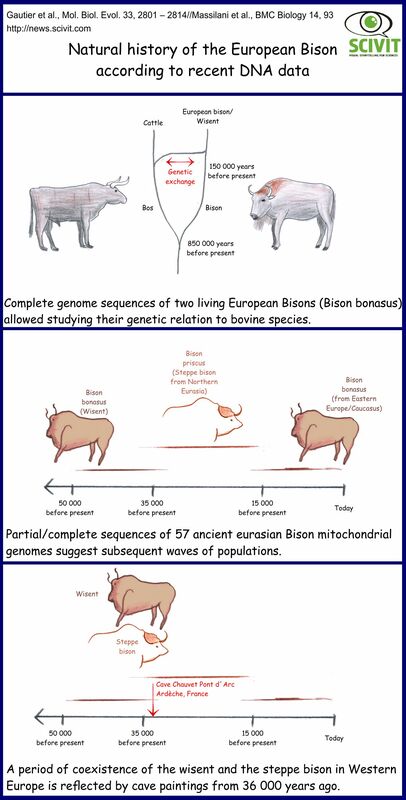 From heterozygosity data they also determined a relatively strong fluctuation of Wisent populations for the past 800 000 years. Massilani and colleagues, in contrast, sequenced only mitochondrial genomes. However, they produced sequences (in part partial) from 57 different ancient specimen distributed all over Europe and Asia. Given the focus on the Wisent and closely related species, their study encompassed a time frame of only 50 000 years. Population development and migration within this time frame was much better resolved, however, when compared to the whole-genome analysis. They could demonstrate that climate shifts were the driver for subsequent waves of different Bison populations. According to Massilani and colleagues, the current (residual) Bison population in Europe (Bison bonasus) originated in Eastern Europe or the Caucasus. The species spread with the end of the last glaciation, is adapted to relatively warm conditions and temperate forests as their habitat. During the last glaciation, in contrast, Europe was populated by Bison priscus, the steppe bison. This species is more adapted to cooler conditions and had originated in Northern Eurasia. It was preceded, from about 50 000 years before present to 35 000 years before present, by another population of Bison bonasus. Precisely this transition from Bison bonasus to Bison priscus has apparently been captured by an ancient (36 000 years before present) cave painting, which depicts typical features of both Bison species.